You are here: Home › News › CubieTruck Plus/Cubieboard5 Released Now! Nowadays, embeded technology and open-source hardware have been growing very fast. With the support of everyone, within a few years, CubieTeam has developed a series of products, from CubieBoard1, CubieBoard2, CubieBoard3 to CubieBoard4. All of them widely praised by community and CubieBoard fans. 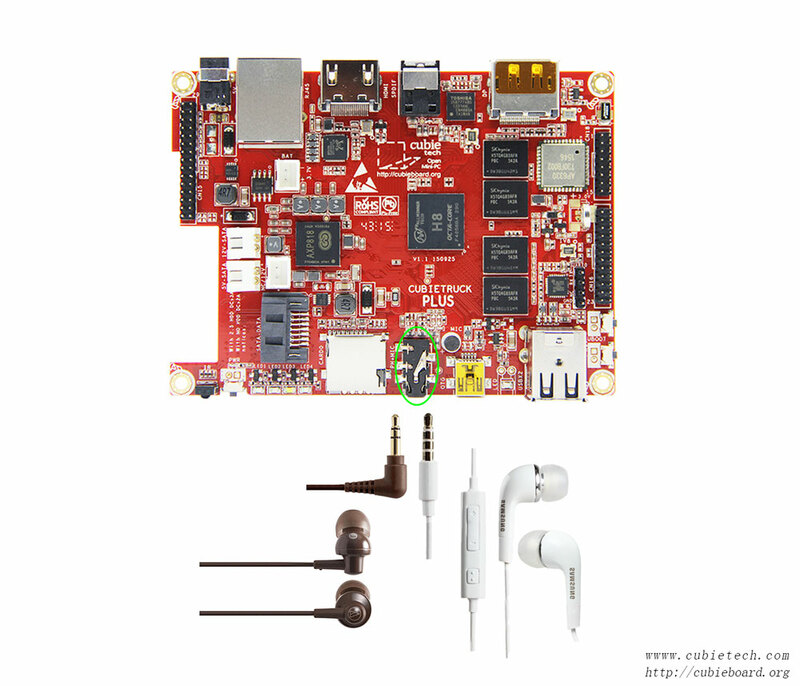 Cubietruck, aka CB3, is the best one in CubieBoard series products, which has CB2`s high cost-performance ratio, improvement of expanding ability and more functions. With the wide application fields, CubieTruck bacame very popular in the community. By 2014, CubieTruck was voted one of the most popular open-source hardware in the market. But technology is vigorously developed, and the performance demand of the market changes so quickly. 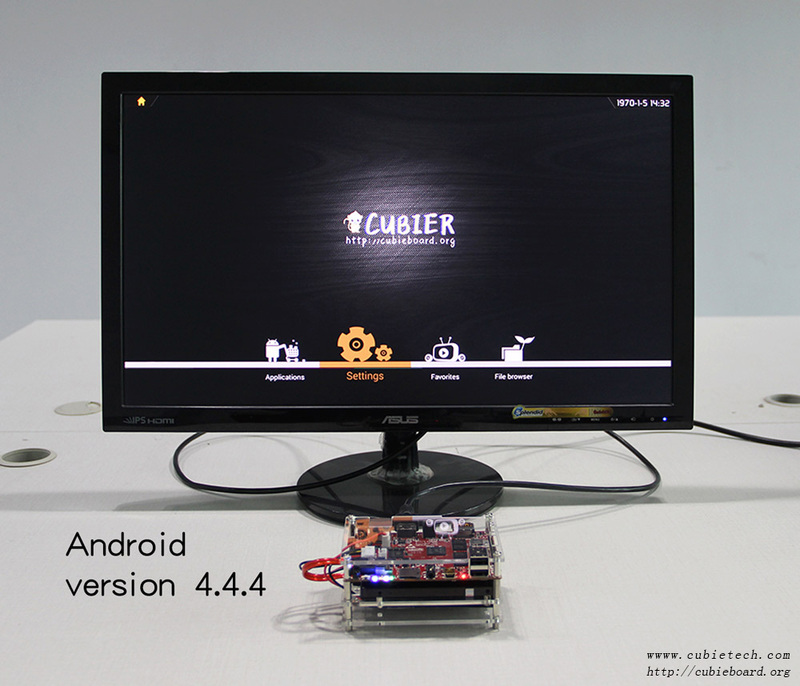 As a dual-core product, CubieTruck’s performance already can’t meet the needs of some CubieBoard users. 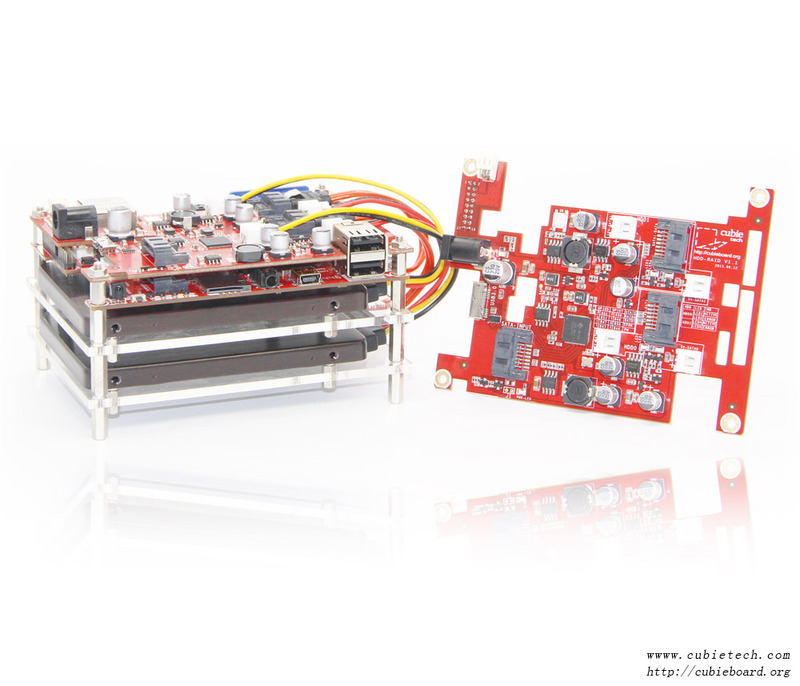 In order to meet strong demand of fans, at the end of 2014 year, we decided to develop a CubiePlus upgrade model, yes, It is ‘CubieTruck plus’, also named “CubieBoard5”. Next I will use CB5 for short. Like the CB3’s design idea of high specifications, stable performance, and rich interfaces, Cubietruck Plus retains all the highlights. We also considered the performance equilibrium、heat controlling and chip price, Finally, we chose the Allwinner’s Octa-Core H8 (Octa-Core Cortex-A7 CPU, up to 2.0GHz，PowerVR SGX544 GPU, up to 700MHz ) as the hardware platform. Both CPU comprehensive performance, and the image processing performance of GPU, compared with the previous CB3, all have been increased by four times. CubieTruck Plus can be connected directly to the SATA hard disk, but also can be built to a dual hard disk array by HDD-RAID subboard which transformed from USB3.0/SATA III to Dual SATA III interfaces. HDD can be configured as 4 modes : RAID0, RAID1, JOBD, PM. Due to its rich Raid modes, people can improve the transmission rate and the safety of data redundancy. This configration can be widely used in these occasions for big data capacity, especially high data security. 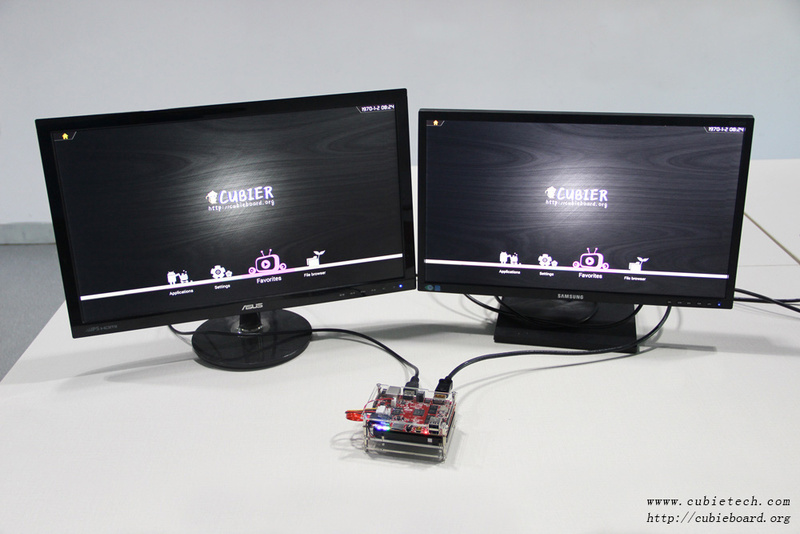 CubieTruck Plus supports DP (Display Port) and HDMI display solutions, and supports dual display and simultaneous display (two screens show the same picture at the same time), also supports hot plug, can be switched freely between the two displays. 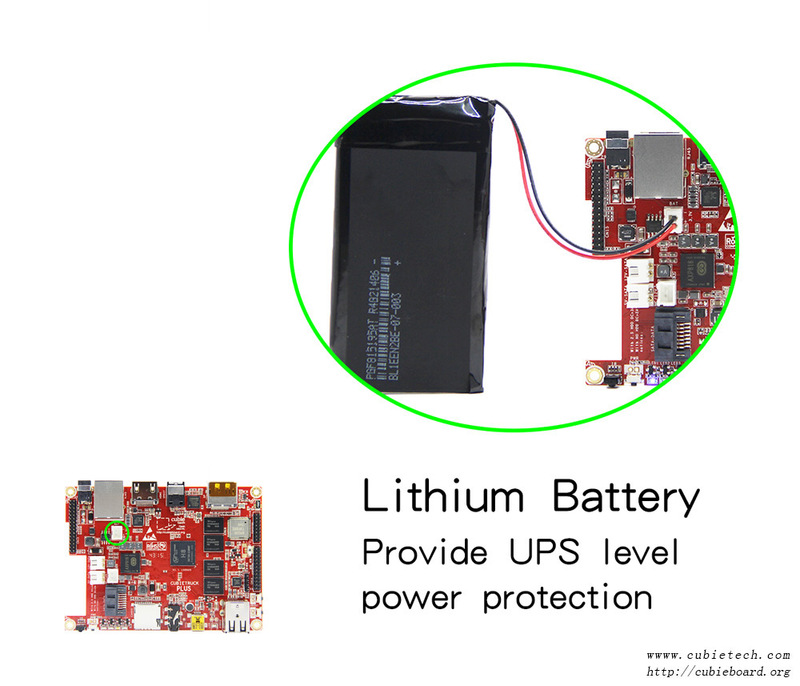 CubieTruck Plus can use lithium battery (such as 3.7 V@5300 mAh) for independent power supply. It can work without connecting other power. This can make CubieTruck Plus become a mobile device, on the other hand it can ensure that data will never lost when the power is cut off accidentally. 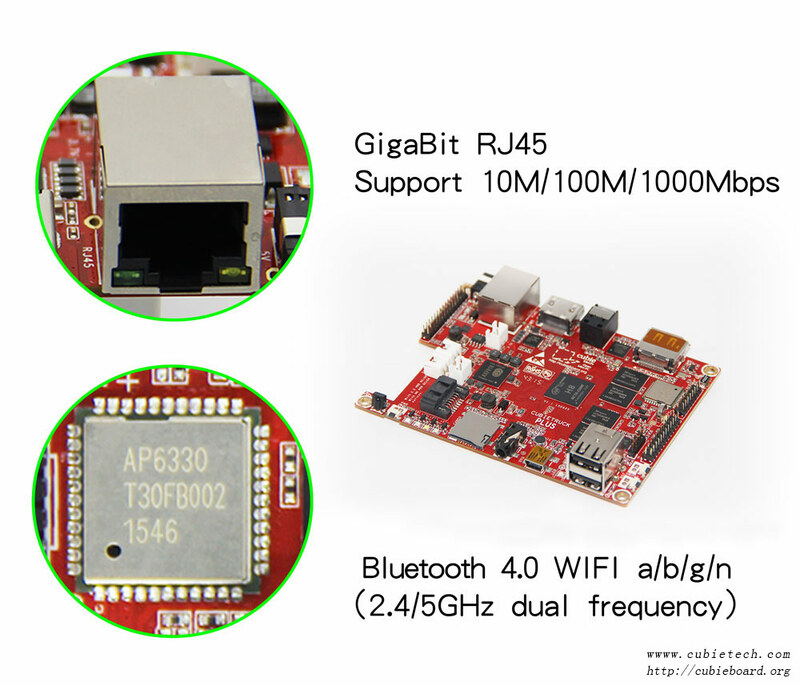 Cubietruck Plus has a Gigabit Ethernet port, at the same time uses the Broadcom Wifi + Bluetooth solution：AP6330 module. 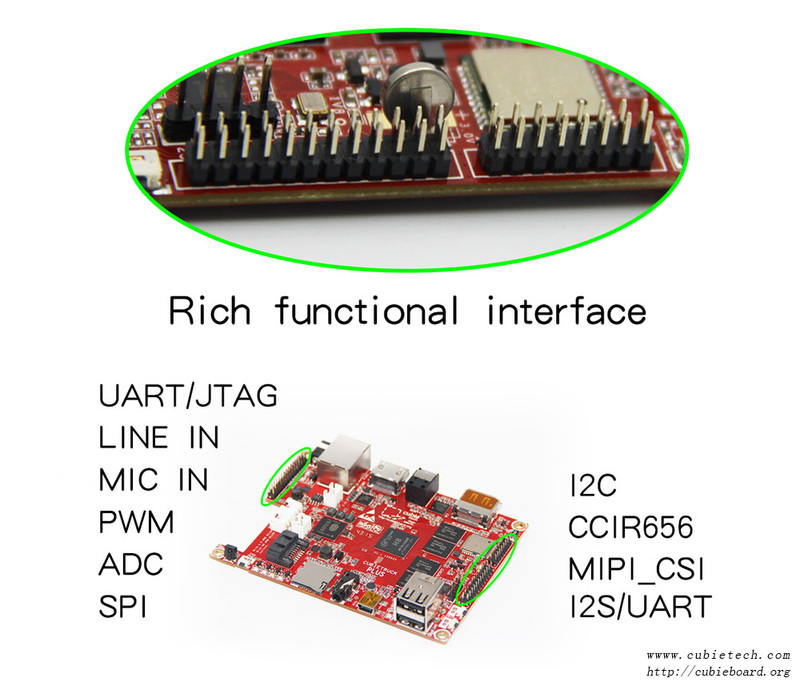 It supports Bluetooth V4.0, but even more remarkable is that it supports 2.4 GHz and 5 Ghz dual-band Wifi. CubieTruck Plus has onboard microphone pickup ,which CubieTruck does not have, and a lot of other development boards don’t have at present. Considering that most cellphones now shipped with headset, so we decided to make CubieTruck Plus also supports the headset with micphone. Compared with Cubietruck’s 54 pins, Expanded pins become 70 pins for the secondary development. Most of them are compatible with the CubieTruck. This is helpful to realize more differentiated ideas in your project. We have prepared a series of accessories, such as: Serial Debug cable, USB Wifi Module, 3G WCDMA Module, IR Remote Controller, USB Camera, HDMI Wireless HD Sticks and so on .Thses make it more convenient to debug and development on our CubieTruck Plus platform and achieve more applications. 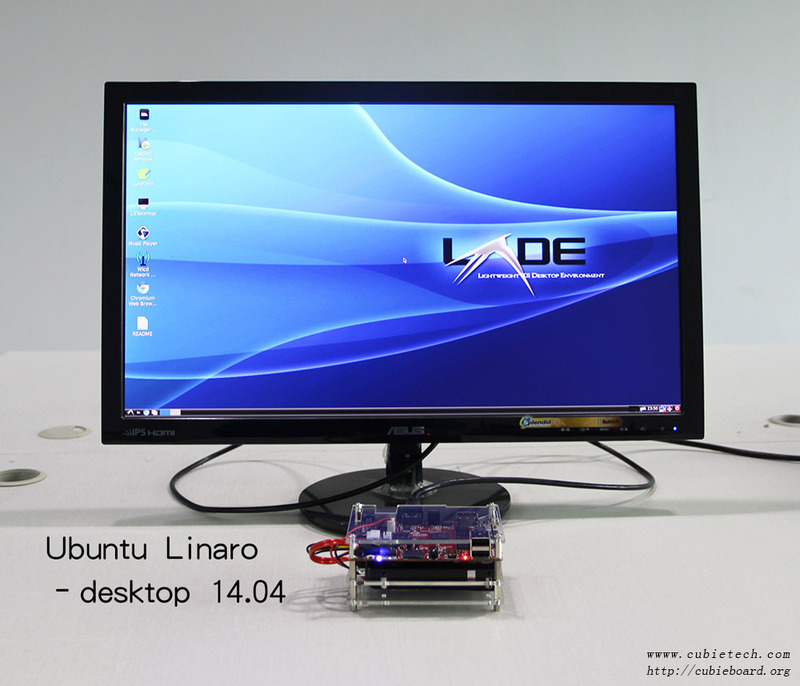 Now CubieTruck Plus not only supports Android 4.4.4 ,but also supports Ubuntu Linaro desktop 14.04. The Uboot and Kernel are open source, players can build their own distributions by themselves . We will support more distribution versions in the future. Welcome to put forward your opinions in the community, publish your needs, participate in the development of open source software. In the coming days, we CubieBoard team will continue to take effort to perfect ecosystem, improve performance and ensure reliability toward intelligent household, monitoring system, server management, and many other areas, in order to meet more different needs of makers and geeks.. Meanwhile we are willing to actively listen to your views, welcome your good suggestions. 6 Responses to "CubieTruck Plus/Cubieboard5 Released Now!" Can you use a DisplayPort-to-HDMI adapter to drive two HDMI displays with this board?